Composites have now gained wide acceptance and validation in aerospace applications. Their weight-to-strength properties promote fuel efficiency and the achievement of energy targets without impacting durability. To address these issues, Collier Research recently released HyperSizer v6 structural sizing and analysis software. HyperSizer v6 integrates with FEA solvers in a continuous, automated iterative loop, conducting trade studies and examining millions of potential design candidates down to the ply—or even element—level. The software ensures structural integrity through a suite of failure analysis predictions that are validated to test data. The tool also enhances manufacturability by minimizing ply drops, identifying and controlling laminate transition drop/add boundaries, and defining best ply shapes and patterns. Developed and proven at NASA, the software—the first ever commercialized by the agency—has a track record of 20% weight reduction in government and commercial aerospace projects. 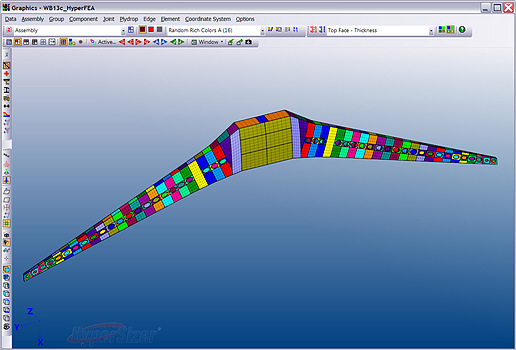 Some of the new features in HyperSizer v6 include the capability to identify, define, and control ply-count compatibility, laminate sequencing, interleaving, and ply-drop minimization; automated compression, shear, and compression-shear post-buckling analyses that serve as the foundation for metal aircraft design; and two novel, damage-tolerant composite architectures are now available—PRSEUS, a dry-fabric woven material poltruded rod structure, and “reinforced core sandwich,” an alternative sandwich panel similar to foam sandwich—providing more structural sizing variables and optimization flexibility. Serving as the analysis hub and automating data transfer during both design and manufacturing cycles, HyperSizer integrates with FEA software, such as Nastran and Abaqus, and with composite CAD tools, such as CATIA and FiberSIM. In addition to aerospace, HyperSizer’s design and manufacturing capabilities are appropriate for optimizing composite-driven designs in a variety of industries including wind energy (turbine blades), marine (ship superstructures), and transportation (high-speed railcars).